LOS ANGELES – The number of provisional ballots still set to be counted might be higher than usual, based on a printing glitch that left nearly 120,000 voters off of Los Angeles Country rolls. 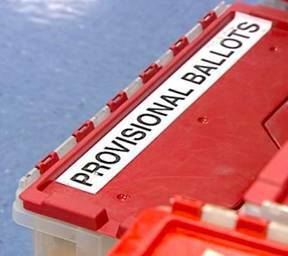 A spokesman for the Registrar-Recorder/County Clerk’s office said an estimate of the total provisional ballots was expected to be released late Wednesday afternoon and the root cause of the error was still being actively investigated. No additional information was available to explain the source or nature of the glitch. According to the county, the printing issue affected the voter rolls at 1,530 of the 4,357 precinct locations. A total of 118,522 voters’ names were omitted from the lists. That represents roughly 2 percent of registered voters. That left some voters — including actor Henry Winkler — surprised to find their names missing when they showed up to vote Tuesday. Dean Logan, the county’s registrar-recorder/county clerk, called the problem a “random issue with the print job that ran the paper rosters,” but said the glitch would not prevent anyone from voting. Affected voters were given provisional ballots at the polling place to ensure their votes would be tabulated. He assured voters that provisional ballots will be tabulated and included in the election results once registration status and eligibility are confirmed. Technically, the provisional ballots could push Los Angeles County candidates who narrowly failed to pick up a majority into winning territory, but that’s extremely unlikely as it would require voters left off county rolls to turn out in much higher proportion that the overall population — where turnout was 18.5 percent — and vote almost exclusively in favor of Sheriff Jim McDonnell and Assessor Jeffrey Prang. Whether other close races in various districts might be affected was not immediately clear. County Supervisor Hilda Solis issued a statement Tuesday urging affected voters to obtain and fill out a provisional ballot. The first ballot counting update from the Registrar-Recorder/County Clerk’s Office is expected Friday, while final certification is tentatively scheduled for June 29.